He gives the beasts their food and the young ravens when they cry. He takes no pleasure in the power of a horse, no delight in human strength; But the Lord delights in those who fear him, who put their trust in his steadfast love. I'm sure many of us have moments when we are woken up by a burning issue. That moment when the ship is grazed by an iceberg and the jolt causes our eyes to open as the captive thoughts rush onto the deck to chatter and look into the darkness and the perils it contains. This, once more, is my lot today and I find myself thinking about madness and the lack of sound and consistent care for those troubled by it; about estate churches and the wide division between rhetoric and reality; of the plight of the Church and the many proclaimed successes which, to those outside, look very much like a bankrupt corner store rearranging the few remaining goods on the shelf in the hope it will attract new customers! Today is set aside to be a 'Day of Intercession and Thanksgiving for the Missionary Work of the Church'. As someone who is engaged with things missional I see this as a day when we pray for those engaged in missionary work here at home and further afield. There are mission fields and unevangelised peoples to be engaged with on our own doorsteps as well as many hours journeying across the seas and landscapes to far flung places. With this in mind perhaps today and the call to prayer might become the spur we need to make us become more aware and intelligent in our prayer . And having discovered the needs and prayed for them, is this enough? Shouldn't the prayers we offer up be accompanied by the sleeves being rolled up as the virtual bags are packed and the journey into strange and foreign lands just a few minutes up the road is made? One of the biggest frustrations I have comes in the shape of those who want to fill the Church with people they have made in their own image. People who live as they live and hold on to the same values and lifestyles as them. I struggle with people who talk of 'bringing back' the lost. A statement which largely (and often blithely) ignores the reality that the majority of those in our villages, towns and cities have never previously been 'here' (meaning in this context Church or church - local or universal) so how can they return to a place they have never been? How often do we pass the needs before us without seeing them or the people who own them? 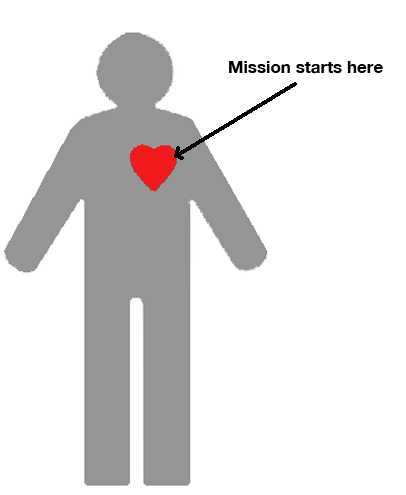 How often do we sigh, shrug and toss the pleas from missions organisations and actions groups? How often do we pass a needy person (and I don't mean those begging on our streets) and mumble, "Be well, be blessed," and move on thinking that our prayer, platitudes and complacency will find favour with the God we claim to worship? So today please stop and think about those who leave the comforts of home to take the Gospel to other lands and cultures. Pray for them, their families and the task before them. Pray for their safety, for provision and for an open door for the work they undertake. Pray for wisdom in all they do and in those they encounter. Perhaps you could send something (a fiver would do) to support an organisation or a missionary family or project. Have a look at the needs of this nation of ours and pray for those who are still 'far off' and for those who seek to make Jesus, the Christ, known. Pray for those in the well-off places; those who have so much they cannot see the poverty they live in. Pray for those in the poorer places. Places where benefits are the norm and jobs, family life, prevailing attitudes and marginalisation are an everyday reality. Pray for those who minister in the estates and in the rural areas (which are just different estates from those we think of). Think about the issues of the places we might be happy not to live or visit and pray for the residents and those who minister to them. Pray for the leaders of the churches of our land that they might have integrity and passion to create, maintain, and encourage those who 'do the stuff' in the difficult places in their own places of influence. Every church building should be the centre of missionary work - every Christian should be committed to those who are far off whether they be 'leavers' who might be encouraged to return or those who have never been part of Church. And those who are 'far off' are so often just a fingertip away. For those who minister in the real places where pressures are hidden in the beauty of nature. For those whose kind act and time given will tell of a God who cares. Motivate, educate, and enthuse us to be hearts and doers of the word. I will give thanks to the Lord with my whole heart, in the company of the faithful and in the congregation. The works of the Lord are great, sought out by all who delight in them. His work is full of majesty and honour and his righteousness endures for ever. The princes of Zoan are utterly foolish; the wise counsellors of Pharaoh give stupid counsel. How can you say to Pharaoh, ‘I am one of the sages, a descendant of ancient kings’? Where now are your sages? Let them tell you and make known what the Lord of hosts has planned against Egypt. The princes of Zoan have become fools, and the princes of Memphis are deluded; those who are the cornerstones of its tribes have led Egypt astray. The Lord has poured into them a spirit of confusion; and they have made Egypt stagger in all its doings as a drunkard staggers around in vomit. Neither head nor tail, palm branch nor reed, will be able to do anything for Egypt. Sound praises to the Lord, all the earth; break into singing and make music. Make music to the Lord with the lyre, with the lyre and the voice of melody. With trumpets and the sound of the horn sound praises before the Lord, the King. O be joyful in the Lord, all the earth; serve the Lord with gladness and come before his presence with a song. Know that the Lord is God; it is he that has made us and we are his; we are his people and the sheep of his pasture. Enter his gates with thanksgiving and his courts with praise; give thanks to him and bless his name. For the Lord is gracious; his steadfast love is everlasting, and his faithfulness endures from generation to generation. On that day their strong cities will be like the deserted places of the Hivites and the Amorites, which they deserted because of the children of Israel, and there will be desolation. For you have forgotten the God of your salvation, and have not remembered the Rock of your refuge; therefore, though you plant pleasant plants and set out slips of an alien god, though you make them grow on the day that you plant them, and make them blossom in the morning that you sow; yet the harvest will flee away on a day of grief and incurable pain. Ah, the roar of nations, they roar like the roaring of mighty waters! The nations roar like the roaring of many waters, but he will rebuke them, and they will flee far away, chased like chaff on the mountains before the wind and whirling dust before the storm. At evening time, lo, terror! Before morning, they are no more. This is the fate of those who despoil us, and the lot of those who plunder us. O Lord, how glorious are your works! Your thoughts are very deep. The senseless do not know, nor do fools understand, That though the wicked sprout like grass and all the workers of iniquity flourish, It is only to be destroyed for ever; but you, O Lord, shall be exalted for evermore. For lo, your enemies, O Lord, lo, your enemies shall perish, and all the workers of iniquity shall be scattered. But my horn you have exalted like the horns of wild oxen; I am anointed with fresh oil. My eyes will look down on my foes; my ears shall hear the ruin of the evildoers who rise up against me. The righteous shall flourish like a palm tree, and shall spread abroad like a cedar of Lebanon. Such as are planted in the house of the Lord shall flourish in the courts of our God. They shall still bear fruit in old age; they shall be vigorous and in full leaf; That they may show that the Lord is true; he is my rock, and there is no unrighteousness in him. maggots are the bed beneath you, and worms are your covering. You said in your heart, ‘I will ascend to heaven; I will raise my throne above the stars of God; I will sit on the mount of assembly on the heights of Zaphon; I will ascend to the tops of the clouds, I will make myself like the Most High.’ But you are brought down to Sheol, to the depths of the Pit. ‘Is this the man who made the earth tremble, who shook kingdoms, who made the world like a desert and overthrew its cities, who would not let his prisoners go home?’ All the kings of the nations lie in glory, each in his own tomb; but you are cast out, away from your grave, like loathsome carrion, clothed with the dead, those pierced by the sword, who go down to the stones of the Pit, like a corpse trampled underfoot. You will not be joined with them in burial, because you have destroyed your land, you have killed your people. May the descendants of evildoers nevermore be named! The Church of England - the Estate we're not in! Today I was so very blessed by a service in a gem of an estate church in Hartlepool. 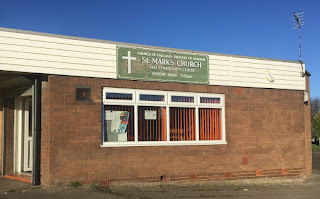 St Mark’s church (Clavering Road) lies at one end of a parade. Being Christ the King (and us being up in the Northeast to think about and reflect on Fresh Expressions at the National FE Conference) we found ourselves in this little place of worship swelling the congregation to something a little shy of twenty warm and living bodies. The Sermon was competently delivered; the Eucharist done with respect and reverence; the welcome was warm and encouraging. The place was a gem and a blessing! 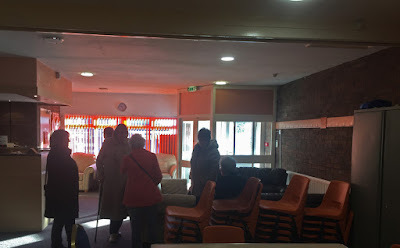 After the service we were invited to fellowship with the regulars. I have to say that in my travels I have experienced so many woeful expression of church which have left me saddened, unfed and, to be honest, totally depressed as the theology, liturgy and welcome was pretty poor. But St Marks was something so very different from what I have come to regard as the norm'! 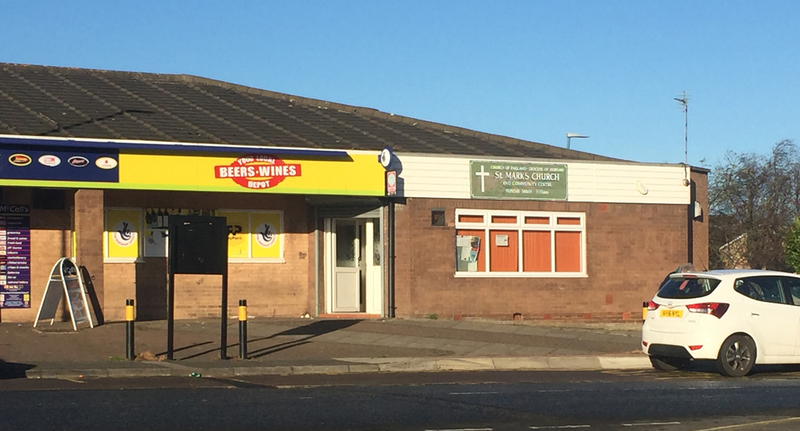 At first glance it didn't look like a church - after all there's no spire and, as you can see from the image above, the yellow signage draws the eye such that you might be forgiven for thinking it's part of the shop. But on closer inspection you soon get to see that it's something a little different from the other two places on this small parade of shops. One serves the community by selling beers, wines and spirits, the second offers the community the staples of life and the third, St Mark's, offers the community that surrounds it the word of God, the inspiration of the Holy Spirit and a place of Welcome, a meeting place for the community: the older folk, the parents and the children. Looking at the geography of the estate. 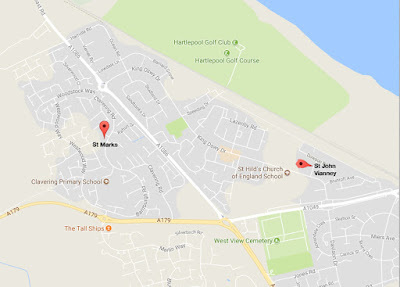 St Mark's and St John Vianney (RC) are well placed to make real a Christian presence in this quite sprawling housing development and proclaim the Gospel of Christ. There's also the Central Methodist 'Estate Church' outside of this map to the Southeast. Here was something that had a heartbeat and yet there was something of sadness about the place. 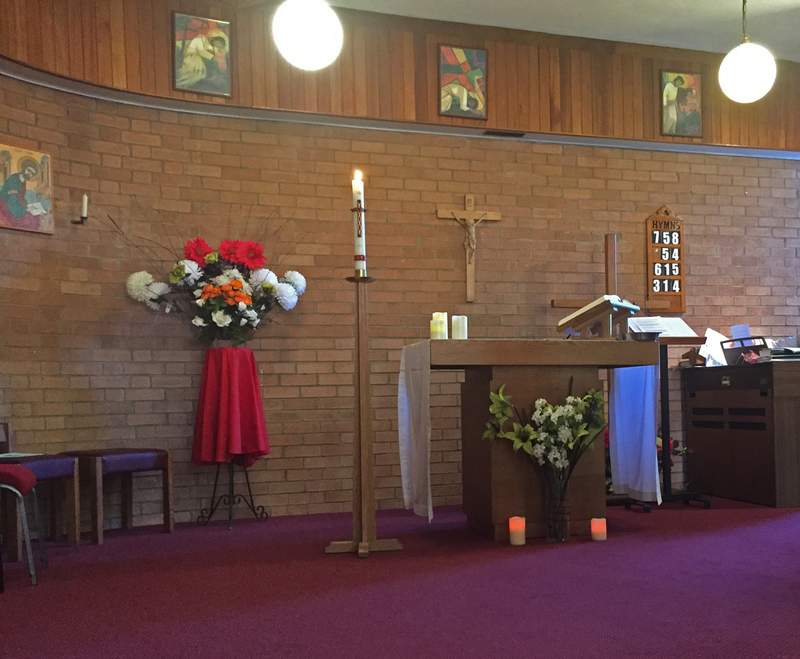 The person preaching spoke of the death of a minister and spoke of the thirty years this faithful little congregation had ministered to the people around them and the fact that this would soon end too. This stopped me in my tracks and the words of the Bishop of Burnley, the Rt Revd Philip North, warning that the Church of England was “complicit in the abandonment of the poor,” and the fact that the decline of support for the estate churches and the poorer areas would undoubtedly grow unless we took note of this and engaged in the placed where 'Jesus is not to be found' (my emphasis) continue to decline unless the bishops, diocesan staff and parish priests acted to redress this. Now when +Phillip said this (and he heads up the CofE estate church committee and is on the executive of the National Estate Churches Network) there was much nodding and agreement - so what's going on here I wondered? How, and why is this being allowed to happen? Imaging my surprise when I mentioned +Phillip's word to the people I was drinking tea with as it transpired that +Phillip began his ministry in this very church (along with one other who also ended up with a pointy hat!)!!! I am saddened and disappointed to have come across this closure. I understand that it doesn't fit in with the deanery plan and undoubtedly the local purple shirt has approved the closure too - but what of those who will not find themselves able to make the journey to a new fellowship? What of those families the Church of England is abandoning? Are we hoping the RC church or the methodists of some other fellowship or denomination will spring up to take up the challenge? The Bible tells us that one side of a story sounds good until we hear the other side. What I do know is that in 1960 multiple beneficed Parishes (MBP) accounted for some 17% of the incumbent bent posts - today this number is 71%. Perhaps this is the case here and what we see is the church rationalising the workload of the incumbent. Perhaps it's about Parish Share and St Mark's is one of those who having little is seeing what it has taken away (amazing how many people don't understand the stewardship and commitment to the Master in the parable of the talents, isn't it?). Somehow feels like a bit of a disgraceful situation to me - I wonder whether this has made the local press like so many of the 'good publicity' projects that abound has? Will there be a note from the CofE in the local paper wishing the people of that area well as they close this work? The light shines in the darkness and it has not been overcome! On that day the Lord will extend his hand yet a second time to recover the remnant that is left of his people, from Assyria, from Egypt, from Pathros, from Ethiopia, from Elam, from Shinar, from Hamath, and from the coastlands of the sea. He will raise a signal for the nations, and will assemble the outcasts of Israel, and gather the dispersed of Judah from the four corners of the earth. 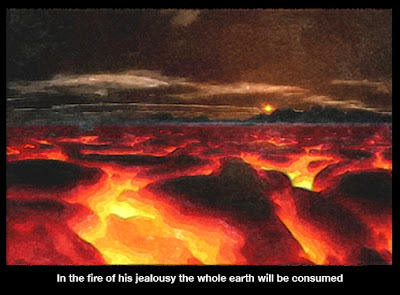 The jealousy of Ephraim shall depart, the hostility of Judah shall be cut off; Ephraim shall not be jealous of Judah, and Judah shall not be hostile towards Ephraim. But they shall swoop down on the backs of the Philistines in the west; together they shall plunder the people of the east. They shall put forth their hand against Edom and Moab, and the Ammonites shall obey them. And the Lord will utterly destroy the tongue of the sea of Egypt; and will wave his hand over the River with his scorching wind; and will split it into seven channels, and make a way to cross on foot; so there shall be a highway from Assyria for the remnant that is left of his people, as there was for Israel when they came up from the land of Egypt. You will say on that day: I will give thanks to you, O Lord, for though you were angry with me, your anger turned away, and you comforted me. With joy you will draw water from the wells of salvation. And you will say on that day: Give thanks to the Lord, call on his name; make known his deeds among the nations; proclaim that his name is exalted. Sing praises to the Lord, for he has done gloriously; let this be known in all the earth. Shout aloud and sing for joy, O royal Zion, for great in your midst is the Holy One of Israel. Heavenly Father, whose blessed Son was revealed to destroy the works of the devil and to make us the children of God and heirs of eternal life: grant that we, having this hope, may purify ourselves even as he is pure; that when he shall appear in power and great glory we may be made like him in his eternal and glorious kingdom; where he is alive and reigns with you, in the unity of the Holy Spirit, one God, now and for ever. Amen. On God alone my soul in stillness waits; from him comes my salvation. He alone is my rock and my salvation, my stronghold, so that I shall never be shaken. How long will all of you assail me to destroy me, as you would a tottering wall or a leaning fence? They plot only to thrust me down from my place of honour; lies are their chief delight; they bless with their mouth, but in their heart they curse. Wait on God alone in stillness, O my soul; for in him is my hope. He alone is my rock and my salvation, my stronghold, so that I shall not be shaken. In God is my strength and my glory; God is my strong rock; in him is my refuge. Put your trust in him always, my people; pour out your hearts before him, for God is our refuge. The peoples are but a breath, the whole human race a deceit; on the scales they are altogether lighter than air. Put no trust in oppression; in robbery take no empty pride; though wealth increase, set not your heart upon it. God spoke once, and twice have I heard the same, that power belongs to God. Steadfast love belongs to you, O Lord, for you repay everyone according to their deeds. Look, the Sovereign, the Lord of hosts, will lop the boughs with terrifying power; the tallest trees will be cut down, and the lofty will be brought low. He will hack down the thickets of the forest with an axe, and Lebanon with its majestic trees will fall. A shoot shall come out from the stock of Jesse, and a branch shall grow out of his roots. The spirit of the Lord shall rest on him, the spirit of wisdom and understanding, the spirit of counsel and might, the spirit of knowledge and the fear of the Lord. His delight shall be in the fear of the Lord. He shall not judge by what his eyes see, or decide by what his ears hear; but with righteousness he shall judge the poor, and decide with equity for the meek of the earth; he shall strike the earth with the rod of his mouth, and with the breath of his lips he shall kill the wicked. Righteousness shall be the belt around his waist, and faithfulness the belt around his loins. All day long they wound me with words; their every thought is to do me evil. They stir up trouble; they lie in wait; marking my steps, they seek my life. Shall they escape for all their wickedness? In anger, O God, cast the peoples down. You have counted up my groaning; put my tears into your bottle; are they not written in your book? Then shall my enemies turn back on the day when I call upon you; this I know, for God is on my side. In God whose word I praise, in the Lord whose word I praise, in God I trust and will not fear: what can flesh do to me? Be merciful to me, O God, be merciful to me, for my soul takes refuge in you; In the shadow of your wings will I take refuge until the storm of destruction has passed by. I will call upon the Most High God, the God who fulfils his purpose for me. He will send from heaven and save me and rebuke those that would trample upon me; God will send forth his love and his faithfulness. I lie in the midst of lions, people whose teeth are spears and arrows, and their tongue a sharp sword. Be exalted, O God, above the heavens, and your glory over all the earth. They have laid a net for my feet; my soul is pressed down; they have dug a pit before me and will fall into it themselves. My heart is ready, O God, my heart is ready; I will sing and give you praise. Awake, my soul; awake, harp and lyre, that I may awaken the dawn. On that day the remnant of Israel and the survivors of the house of Jacob will no more lean on the one who struck them, but will lean on the Lord, the Holy One of Israel, in truth. A remnant will return, the remnant of Jacob, to the mighty God. For though your people Israel were like the sand of the sea, only a remnant of them will return. Destruction is decreed, overflowing with righteousness. For the Lord God of hosts will make a full end, as decreed, in all the earth. He has gone up from Rimmon, he has come to Aiath; he has passed through Migron, at Michmash he stores his baggage; they have crossed over the pass, at Geba they lodge for the night; Ramah trembles, Gibeah of Saul has fled. Cry aloud, O daughter Gallim! Listen, O Laishah! Answer her, O Anathoth! Madmenah is in flight, the inhabitants of Gebim flee for safety. This very day he will halt at Nob, he will shake his fist at the mount of daughter Zion, the hill of Jerusalem. When he entered Capernaum, a centurion came to him, appealing to him and saying, ‘Lord, my servant is lying at home paralysed, in terrible distress.’ And he said to him, ‘I will come and cure him.’ The centurion answered, ‘Lord, I am not worthy to have you come under my roof; but only speak the word, and my servant will be healed. For I also am a man under authority, with soldiers under me; and I say to one, “Go”, and he goes, and to another, “Come”, and he comes, and to my slave, “Do this”, and the slave does it.’ When Jesus heard him, he was amazed and said to those who followed him, ‘Truly I tell you, in no one in Israel have I found such faith. I tell you, many will come from east and west and will eat with Abraham and Isaac and Jacob in the kingdom of heaven, while the heirs of the kingdom will be thrown into the outer darkness, where there will be weeping and gnashing of teeth.’ And to the centurion Jesus said, ‘Go; let it be done for you according to your faith.’ And the servant was healed in that hour. Heavenly Lord, you long for the world’s salvation: stir us from apathy, restrain us from excess and revive in us new hope that all creation will one day be healed in Jesus Christ our Lord. Amen. The Lord sent a word against Jacob, and it fell on Israel; and all the people knew it - Ephraim and the inhabitants of Samaria - but in pride and arrogance of heart they said: ‘The bricks have fallen, but we will build with dressed stones; the sycamores have been cut down, but we will put cedars in their place.’ So the Lord raised adversaries against them, and stirred up their enemies, the Arameans in the east and the Philistines in the west, and they devoured Israel with open mouth. For all this, his anger has not turned away; his hand is stretched out still. The people did not turn to him who struck them, or seek the Lord of hosts. So the Lord cut off from Israel head and tail, palm branch and reed in one day - elders and dignitaries are the head, and prophets who teach lies are the tail; for those who led this people led them astray, and those who were led by them were left in confusion. That is why the Lord did not have pity on their young people, or compassion on their orphans and widows; for everyone was godless and an evildoer, and every mouth spoke folly. For all this, his anger has not turned away; his hand is stretched out still. For wickedness burned like a fire, consuming briers and thorns; it kindled the thickets of the forest, and they swirled upwards in a column of smoke. Through the wrath of the Lord of hosts the land was burned, and the people became like fuel for the fire; no one spared another. They gorged on the right, but still were hungry, and they devoured on the left, but were not satisfied; they devoured the flesh of their own kindred; Manasseh devoured Ephraim, and Ephraim Manasseh, and together they were against Judah. For all this, his anger has not turned away; his hand is stretched out still. Ah, you who make iniquitous decrees, who write oppressive statutes, to turn aside the needy from justice and to rob the poor of my people of their right, that widows may be your spoil, and that you may make the orphans your prey! What will you do on the day of punishment, in the calamity that will come from far away? To whom will you flee for help, and where will you leave your wealth, so as not to crouch among the prisoners or fall among the slain? For all this, his anger has not turned away; his hand is stretched out still. ‘Do not judge, so that you may not be judged. For with the judgement you make you will be judged, and the measure you give will be the measure you get. Why do you see the speck in your neighbour’s eye, but do not notice the log in your own eye? Or how can you say to your neighbour, “Let me take the speck out of your eye”, while the log is in your own eye? You hypocrite, first take the log out of your own eye, and then you will see clearly to take the speck out of your neighbour’s eye. ‘Do not give what is holy to dogs; and do not throw your pearls before swine, or they will trample them under foot and turn and maul you. ‘In everything do to others as you would have them do to you; for this is the law and the prophets. Eternal God, whose servant Edmund kept faith to the end, both with you and with his people, and glorified you by his death: grant us such steadfastness of faith that, with the noble army of martyrs, we may come to enjoy the fullness of the resurrection life; through Jesus Christ your Son our Lord, who is alive and reigns with you, in the unity of the Holy Spirit, one God, now and for ever. Amen. The Gospel reading today presents a real challenge as we learn of a master with three servants and some talents! All too often the word ‘talent’ is used by the person preaching to mean skills or abilities (the way we use the word today) but a talent was a weight of around 35kg. In the NIV version the servants are entrusted with five, two and one bag of gold until the ‘man’ returns. iii. Being ready for the return of the master. When the master returns, two of them are praised for their endeavours whilst the third is labelled as ‘wicked’ and booted out into the darkness and the one with nothing loses it whilst the one with the most gets more. Always a tough concept to explain as biblical in my experience! Two of the servants acted out of understanding and were engaged and proved themselves to be trustworthy whilst the remaining slave acted out of fear and through this was inactive and therefore unproductive. Looking at this passage in the light of the wise and foolish virgins last week, if we exchange the bridegroom of last week and the master of this for Jesus as the returning person, there is much insight to be gained here. If the absence is the time from Ascension to second coming then the return is the second coming and the Judgement that accompanies the ‘day of the Lord’. Just as the unprepared virgins miss out, so too does the servant who buried what he’d been given. Switching the bags of gold for the kingdom of God and think about what this passage might mean for us today. The key here is the preparedness of the three. Two had acted rightly and were prepared for their master’s return whilst the last man had done nothing to make himself ready for the eventual return. The last man had lived in fear and this had made the weak and ineffective – for of the three he did the least with what he had been entrusted. We have a parable about Church and stewardship and readiness. So many people are made impotent because they are full of fear such which causes them to live within the limits they create in the heads. A parable about being ready to give an account of ourselves to Jesus, the Christ, when He returns. Those who live in fear also live outside of faith (for perfect love casts out fear and that which is not done in faith is done in unbelief) and they fail , and for them there is the ‘weeping and wailing and gnashing of teeth’ image of separation from the presence of God. It’s a warning about the end times and judgement – and that what the Thessalonians passage brings to the party too for ‘the day of the Lord will come like a thief in the night.’ This is affirming the fact that no one knows when the Lord (Jesus) will return, just as the three servants had no idea about when their master might return either! These two passages speak of the same thing: Jesus’ return. These two passages speak about a judgement that is to come when the Lord returns and the contrasts between right and wrong living; darkness or light, awake or asleep, drunk or sober. Think how the two good servants contrast with the wicked servant. And knowing that Jesus will return we need to make sure that we are ready for it. There’s no warning notice – we need to be ready for it all the time! The labour pains mean that we will have a clue that the time is getting nearer, and yet the exact time is unknown (you can’t book it in like a caesarean!). We are people of the light, which means we do our deeds in the light where everyone can see what we do and we are called to protect our heart (our passions) and our heads (our thought life) to ensure that head and heart are kept as pure as possible so that our lives might also be that too: Something made real in the faith, hope and love that is the hallmark of people of faith. And the day will come when the Lord returns and we will be ‘caught up’ with Him and the judgement will occur and the words we long to hear, “Well done, good and faithful servant,” will, we pray, be ours. Our final reading (Zephaniah) and the ‘day of the Lord’ - the return of the Messiah (Jesus) - and the ‘good and faithful servants’ will be ‘Consecrated’ (That is made pure and spotless just as Jesus is pure and spotless). Jesus, our paschal lamb, a sacrifice made for our sins will have made us pure and spotless. But the complacent, they get the same as the man in the Matthew story who though fear was also that for isn’t this all about judgment, end times and the weak, apathetic, complacent servant of God? All too often I meet Christians (Lay and ordained) who appear to be pathetic and ineffective. They bury the gift of God and await the return of the King ready to give back what has been entrusted to them, and so the Church fails to grow. God would rather we were passionate and courageous, bringing forth growth and life, rather than confusing weak for meek and hiding out of the public eye. For don’t be fooled, the ‘day of the Lord’ is coming – and it’s nearer today that it was yesterday. Love brings forth passion and passion brings forth action – Perfect love casts out fear (1 John 4.18) – but fear denies the love of God made real for us in Christ and buries the riches given to us through Christ in the ground. We are called to ‘go into all the world to make disciples’ – could this be the treasure we are entrusted with, the kingdom of God, to present to the Lord when He returns. Have a think about the scribbles here and ask yourself the question, “How am I doing and am I ready to meet the Lord should He arrived unexpectedly in the next few minutes?" And if the answer is 'NO", then I guess this gives you the opportunity to save yourself from the darkness and the weeping and gnashing of teeth bit! But you, brothers and sisters, are not in darkness so that this day should surprise you like a thief. You are all children of the light and children of the day. We do not belong to the night or to the darkness. So then, let us not be like others, who are asleep, but let us be awake and sober. For those who sleep, sleep at night, and those who get drunk, get drunk at night. But since we belong to the day, let us be sober, putting on faith and love as a breastplate, and the hope of salvation as a helmet. For God did not appoint us to suffer wrath but to receive salvation through our Lord Jesus Christ. He died for us so that, whether we are awake or asleep, we may live together with him. Therefore encourage one another and build each other up, just as in fact you are doing. The great day of the Lord is near - near and coming quickly. The cry on the day of the Lord is bitter; the Mighty Warrior shouts his battle cry. That day will be a day of wrath - a day of distress and anguish, a day of trouble and ruin, a day of darkness and gloom, a day of clouds and blackness - a day of trumpet and battle cry against the fortified cities and against the corner towers. In the fire of his jealousy the whole earth will be consumed, for he will make a sudden end of all who live on the earth. while malice is in their hearts. Repay them according to their deeds and according to the wickedness of their devices. Reward them according to the work of their hands and pay them their just deserts. They take no heed of the Lord’s doings, nor of the works of his hands; therefore shall he break them down and not build them up. The Lord is my strength and my shield; my heart has trusted in him and I am helped; Therefore my heart dances for joy and in my song will I praise him. For I held my tongue; my bones wasted away through my groaning all the day long. Your hand was heavy upon me day and night; my moisture was dried up like the drought in summer. I said, ‘I will confess my transgressions to the Lord,’ and you forgave the guilt of my sin. Therefore let all the faithful make their prayers to you in time of trouble; in the great water flood, it shall not reach them. ‘I will instruct you and teach you in the way that you should go; I will guide you with my eye. Great tribulations remain for the wicked, but mercy embraces those who trust in the Lord. Then the Lord said to me, Take a large tablet and write on it in common characters, ‘Belonging to Maher-shalal-hash-baz’, and have it attested for me by reliable witnesses, the priest Uriah and Zechariah son of Jeberechiah. And I went to the prophetess, and she conceived and bore a son. Then the Lord said to me, Name him Maher-shalal-hash-baz; for before the child knows how to call ‘My father’ or ‘My mother’, the wealth of Damascus and the spoil of Samaria will be carried away by the king of Assyria. The Lord spoke to me again: Because this people has refused the waters of Shiloah that flow gently, and melt in fear before Rezin and the son of Remaliah; therefore, the Lord is bringing up against it the mighty flood waters of the River, the king of Assyria and all his glory; it will rise above all its channels and overflow all its banks; it will sweep on into Judah as a flood, and, pouring over, it will reach up to the neck; and its outspread wings will fill the breadth of your land, O Immanuel. Band together, you peoples, and be dismayed; listen, all you far countries; gird yourselves and be dismayed; gird yourselves and be dismayed! Take counsel together, but it shall be brought to naught; speak a word, but it will not stand, for God is with us. For the Lord spoke thus to me while his hand was strong upon me, and warned me not to walk in the way of this people, saying: Do not call conspiracy all that this people calls conspiracy, and do not fear what it fears, or be in dread. But the Lord of hosts, him you shall regard as holy; let him be your fear, and let him be your dread. He will become a sanctuary, a stone one strikes against; for both houses of Israel he will become a rock one stumbles over—a trap and a snare for the inhabitants of Jerusalem. And many among them shall stumble; they shall fall and be broken; they shall be snared and taken. Our Father in heaven, hallowed be your name. Your kingdom come. Your will be done, on earth as it is in heaven. Give us this day our daily bread. And forgive us our debts, as we also have forgiven our debtors. And do not bring us to the time of trial, but rescue us from the evil one. For if you forgive others their trespasses, your heavenly Father will also forgive you; but if you do not forgive others, neither will your Father forgive your trespasses. O God, who endowed your servant Hugh with a wise and cheerful boldness and taught him to commend to earthly rulers the discipline of a holy life: give us grace like him to be bold in the service of the gospel, putting our confidence in Christ alone, who is alive and reigns with you, in the unity of the Holy Spirit, one God, now and for ever. Amen. Give judgement for me, O Lord, for I have walked with integrity; I have trusted in the Lord and have not faltered. 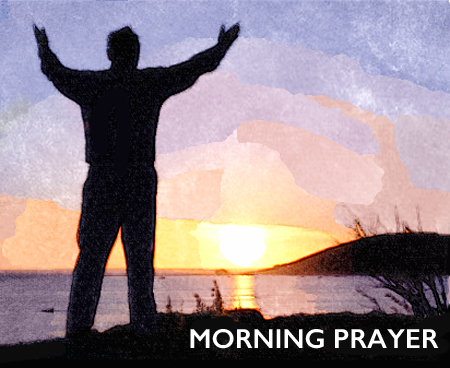 Test me, O Lord, and try me; examine my heart and my mind. For your love is before my eyes; I have walked in your truth. I will wash my hands in innocence, O Lord, that I may go about your altar, to make heard the voice of thanksgiving and tell of all your wonderful deeds. Lord, I love the house of your habitation and the place where your glory abides. Sweep me not away with sinners, nor my life with the bloodthirsty, Whose hands are full of wicked schemes and their right hand full of bribes. As for me, I will walk with integrity; redeem me, Lord, and be merciful to me. My foot stands firm; in the great congregation I will bless the Lord. And now shall he lift up my head above my enemies round about me; Therefore will I offer in his dwelling an oblation with great gladness; I will sing and make music to the Lord. The head of Ephraim is Samaria, and the head of Samaria is the son of Remaliah. If you do not stand firm in faith, you shall not stand at all. God, the ruler of all, who called your servant Margaret to an earthly throne and gave her zeal for your Church and love for your people that she might advance your heavenly kingdom: mercifully grant that we who commemorate her example may be fruitful in good works and attain to the glorious crown of your saints; through Jesus Christ your Son our Lord, who is alive and reigns with you, in the unity of the Holy Spirit, one God, now and for ever. Amen.